Authorities in Berkeley on Friday are prepping for violence. Two separate rallies — one in support of President Donald Trump and the other pitted against the commander in chief — are slated for Saturday at Civic Center Park, but authorities are worried that attendees could become rowdy and potentially dangerous, just as some did during a "March 4 Trump" rally roughly one month ago. 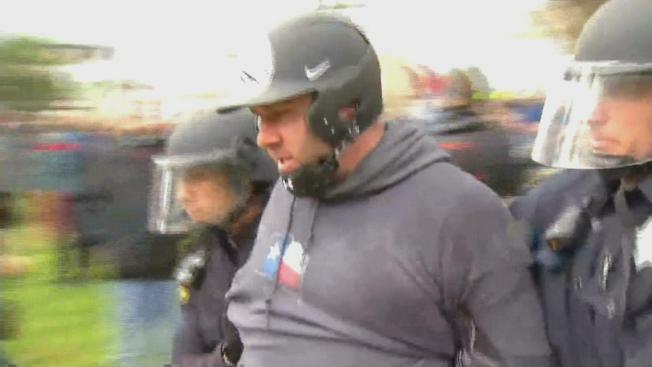 In order to prevent a bloody riot, city leaders announced that pipes, bats, bricks, rocks, glass bottles, shields, pepper spray and other potentially dangerous items are not allowed at the park during the rallies. Signs and flags must also be held alone. They cannot be attached to sticks or poles. Authorities in Berkeley are preparing for violence ahead of pro-Trump and anti-Trump rallies slated for Saturday. Kim Yonenaka reports. Arrests will be made if the rallies get out of control, according to police. In order to avoid a potential run-in with authorities, Matthai Chakko from the East Bay city urges participants to stay away from any violence that crops up. "One of the things we ask people to do — peaceful protesters — is to separate themselves from people committing violence," he said. "That not only keeps them safe, but allows police to intervene in a way that is more effective." A weekly farmers market in Berkeley slated to once again take place this upcoming Saturday at the park was called off amid the scheduled political protests, according to reports. One bank near the park is also taking precautionary steps in anticipation of riots breaking out. It has boarded up its windows and announced that it will close early on Saturday. 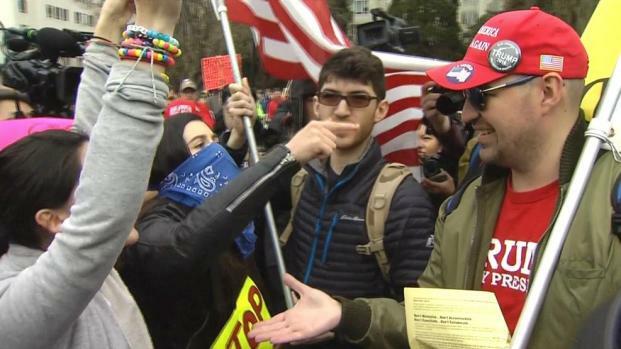 In addition to last month's brawls, the scheduled rallies also come on the heels of violent clashes between police and protesters when controversial speaker and then-Breitbart News writer Milo Yiannopoulos came to the UC Berkeley campus in February.